There is so much I could say about James Cotton. I have been a fan of his band since I got into blues heavily around 1968. By 1970, I had worn the grooves out on two of his LP's and had to buy new ones. I always considered his band with Luther Tucker, Alberto Gianquinto, Bobby Anderson, and Francis Clay to be the epitome of a Chicago blues band. Sure there was Muddy and Little Walter and Wolf, but something about this band was just different. Maybe the soul tunes they did, like Somethin’ You Got, sung so plaintively by Bobby did it for me. Maybe Tucker's soulful vocal and incendiary solo on Fallin’ Rain was the key. Alberto’s Spanish tinged piano and great organ playing, along with Francis Clay's innovative drumming, hit the spot. Whatever it was it has stuck with me all these many years. At the age of seventeen I fantasized about playing with these guys someday. I saw this band around 1969 in New York City and was floored. One night in 1970, I was attending a Monday night jam session at the Nightcap Lounge in Brooklyn that was hosted by the Brooklyn Blues Busters, who walked in but James Cotton. If Babe Ruth walked in I wouldn't have been any more excited. I shook his hand and he blew a few tunes with the band. It was shortly thereafter that I moved to Chicago and began working with Sunnyland Slim and Big Walter Horton, and a slew of other legends, and once in a while Cotton would come in and blow a tune or two. However, in those days, he was very busy on the road and constantly touring. He was like a big time-rock star, big time. He kept that rigorous schedule up for most of the 70’s and 80’s. I also remember the late Ray Allison trying to get me to join the band a couple of time: "Come on killer, we have a lot of fun and steady work on the road, Pays good too!” As I had just gotten married and had a brand new baby, I decided to take a pass. I didn't want any new craziness at that time. I remember this one night-around 1991 or 1992. It was a Sunday night and I was at my regular gig with Sunnyland at BLUES. Out of nowhere, there is Cotton standing by the piano grinning at Slim. Sunnyland immediately gets on the mic and says "Pig is in the house! Pig in the house!" I thought he was insulting Cotton, but on the break James whispered in my ear, in his raspy whispery voice, "They call me Pig because I eat pork three or four times a day." Well, around 1994, my pal Bob Margolin, who had been doing gigs with James, recommended me for the job, and I started touring with the James Cotton Blues Trio, which usually was me, David Maxwell on piano, and Darrell Nulisch. Later on, I did the singing and we had Rico McFarland in the band as well. We did lots of gigs without a drummer, but on one tour we took Willie Smith. Willie was a link back to the old Muddy Waters band for sure. It was great being around those guys. My favorite memory of those days was seeing Willie come down to blow harp and sing while Cotton got behind the drums, and with a huge smile and a gold tooth shining in the lights, laid a fatback beat straight out of the 50's. I really miss those guys and those days. Cotton was a cool guy to work for. He paid great, and many times he would personally come to my room and pay me and thank me for my work. We ALWAYS had single rooms. There was no doubling up or couches with that band. If not for him, I may not have moved out here to California, as it was on one of those tours that I fell in love with this beautiful state. 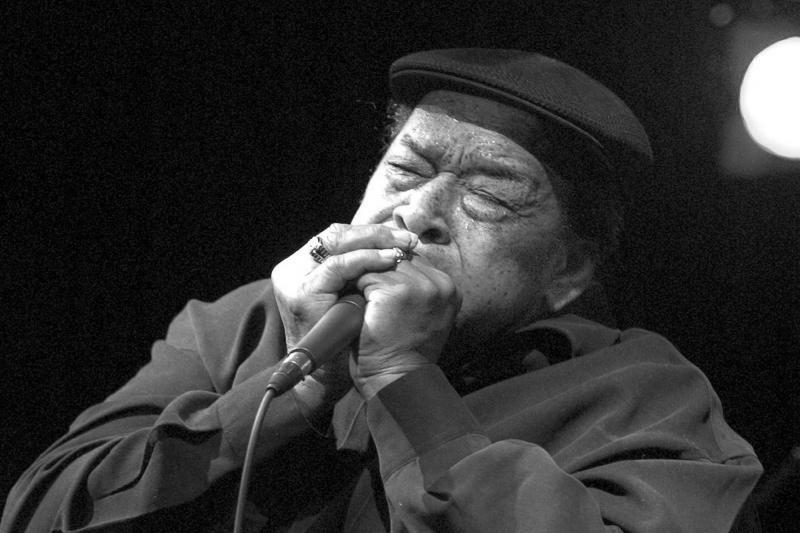 Goodbye James Cotton...May your spirit and music live on through the ages.